Set on a lush and tropical island, the resort is fringed by white sandy beaches, coconut trees and is surrounded by a crystal clear emerald lagoon. 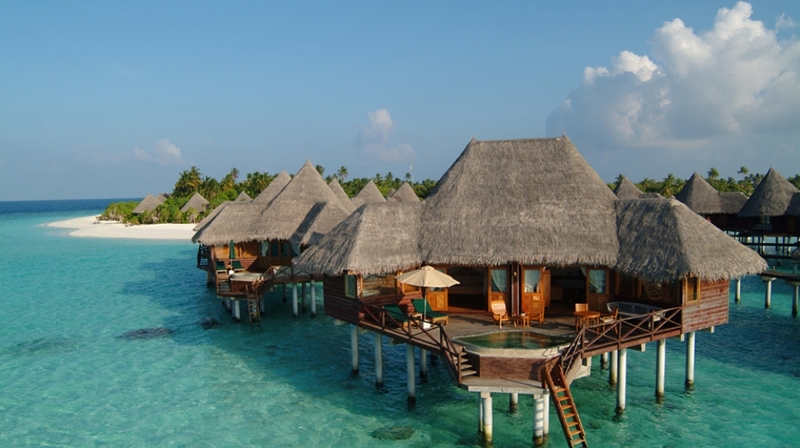 The individual villas and suites open directly on to the garden and beach front or are built on stilts over the lagoon. Wood, rattan and cool furnishing create an atmosphere of sophisticated elegance. 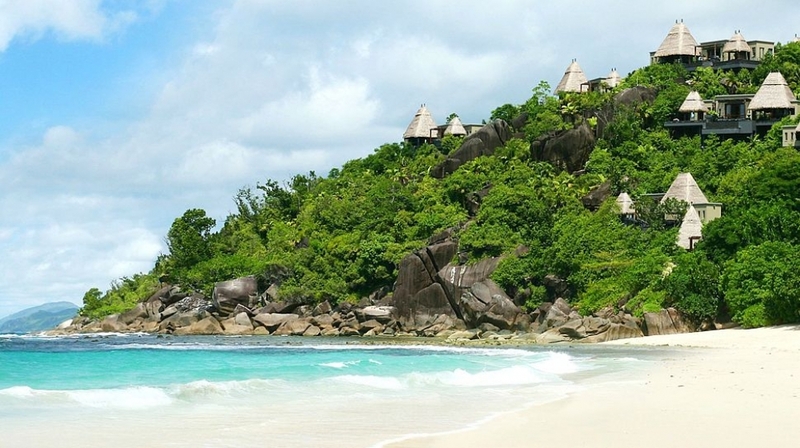 The ambience of the island is enchanting and is a perfect honeymoon hideaway. 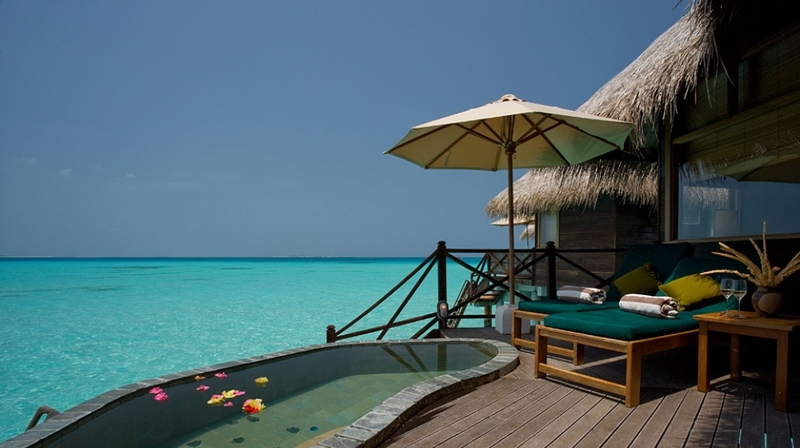 Sunset Lagoon Villas: This is the height of exclusivity. An indulgence of space featuring a king-size four-poster bed, living room decked with designer furnishings, luxurious ocean-view bathroom with deluxe spa bath and indoor/outdoor showers. Enjoy the private terrace with large sunken fresh water splash pool over the lagoon and outdoor seating positioned for the most stunning views � all in undisturbed privacy. A personal butler is on hand at all times to attend to every need. For complete relaxation, in-villa spa treatments are also available on request. Life doesn�t get more pleasurable than this. 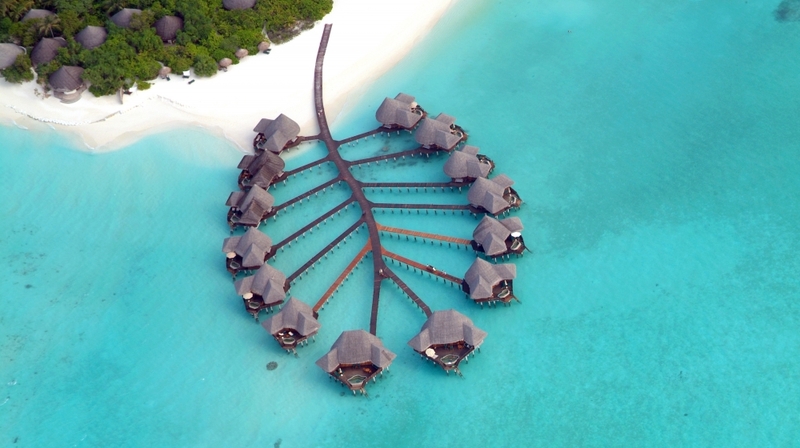 Lagoon Villas: Our unique wooden Lagoon Villas offer absolute indulgence for those who are looking for exclusivity and seclusion. 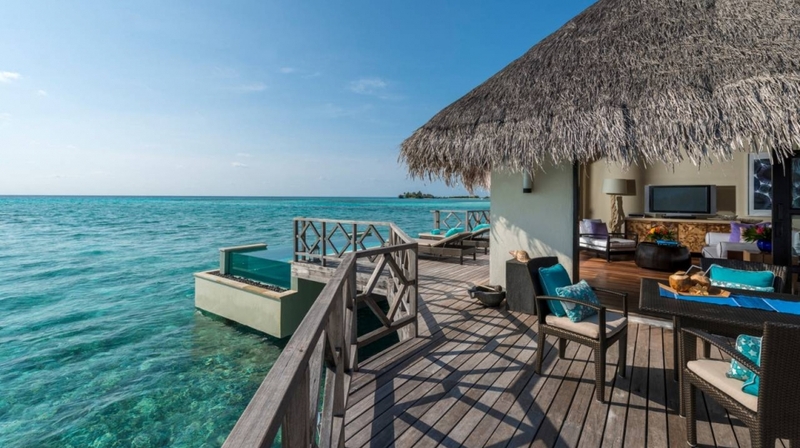 All Lagoon Villas are fitted with a Jacuzzi bathroom overlooking the turquoise waters of the lagoon, sunken fresh-water splash pools on the large sundeck, four poster beds and luxurious furniture, fittings and amenities. 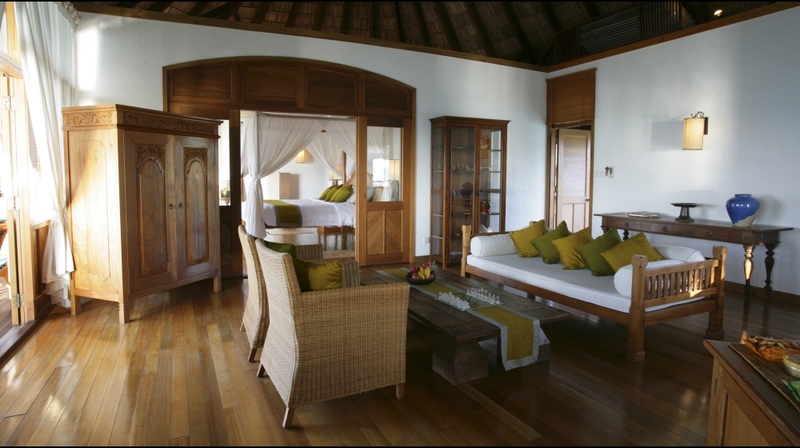 Deluxe Villas: Nestled amid the island�s lush vegetation, the Beach Villas invite you to relax in a spacious bedroom with high-pitched ceiling. The Deluxe villas are complemented with a sunken bath in the open-air bathroom, and a private fresh-water plunge pool on the outdoor terrace. 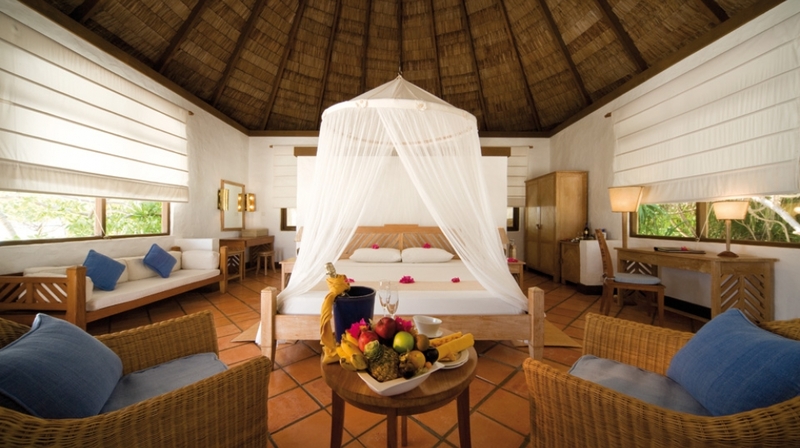 A four-poster bed with mosquito net enhances the romance of the villas. Beach Villas: Located overlooking the ocean, the Beach Villas invite you to relax in a spacious bedroom with high-pitched ceiling and king-size bed. 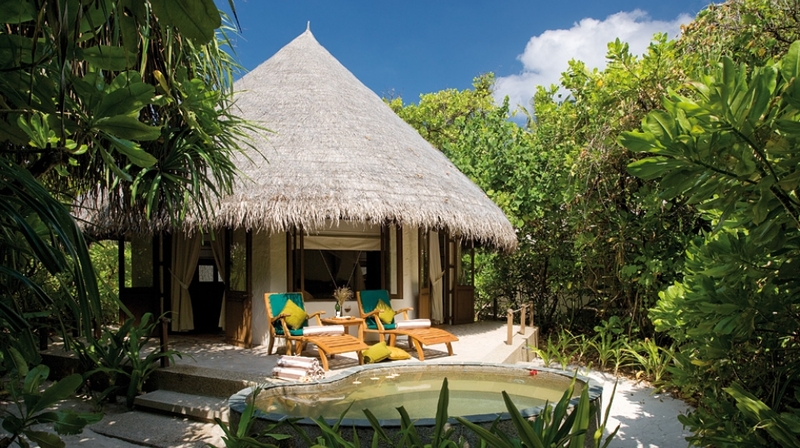 The Beach Villas offer an open air garden bathroom for showers at sunrise or under the stars at night. The private terrace with outdoor seating provides the perfect setting for relaxation just moments from the white sandy beach. The Coco Spa at Dhuni Kolhu is a tranquil space created to indulge personal desires for beauty, well-being and relaxation. Discover the benefits of treatments from Indonesia, Thailand and India. A collection of Ayurvedic-inspired products enhances this truly unique spa experience. In-villa spa treatments are available if preferred. Coco Palm Dhuni Kolhu offers a choice of unique indoor and outdoor venues with an understated chic ambiance, offering delicious cuisine and fine wines for the discerning palate. 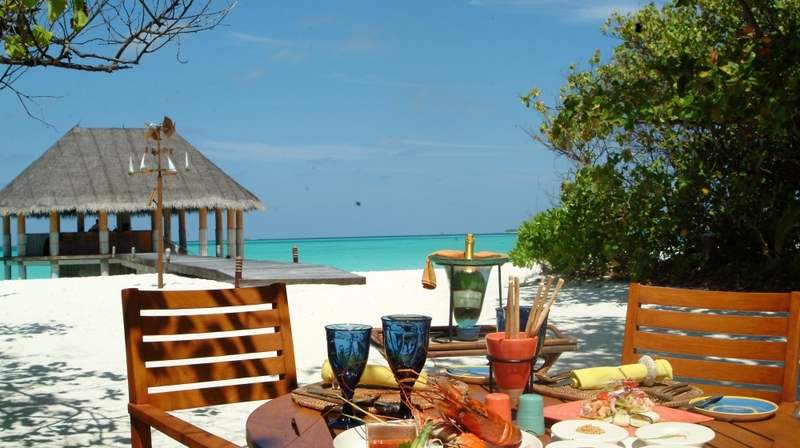 A huge atmospheric dining room, with a Maldivian tent like roof, featuring live action cooking at various food kitchens. International cuisine buffetstyle and a la carte menus. A gem of a location for a restaurant, with views of the ocean yet hidden amid luxuriant vegetation for tranquility. 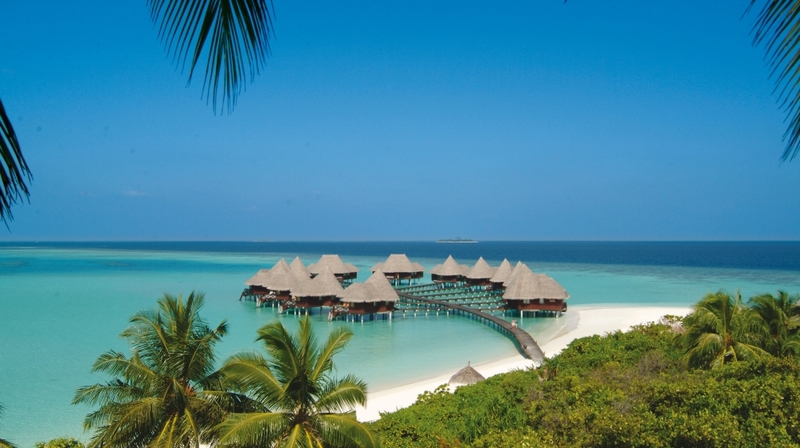 Specialty dishes including Maldivian, Thai, Indian and other Asian delicacies. 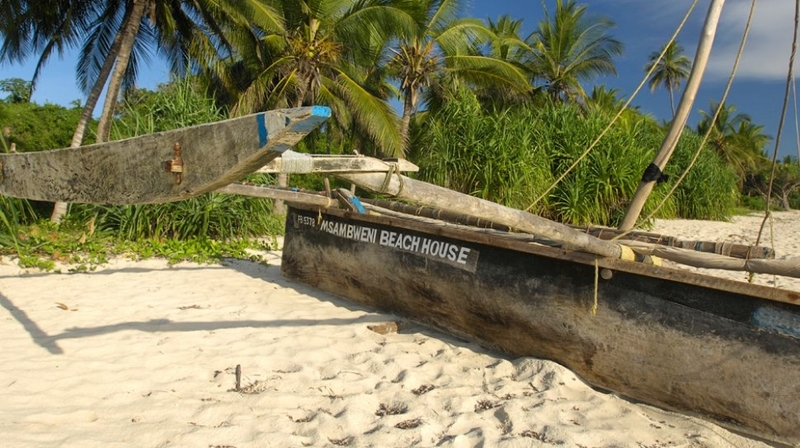 A restaurant to enjoy freshly grilled fish and seafood in open air setting with ocean views. The mood is stylish casual here. 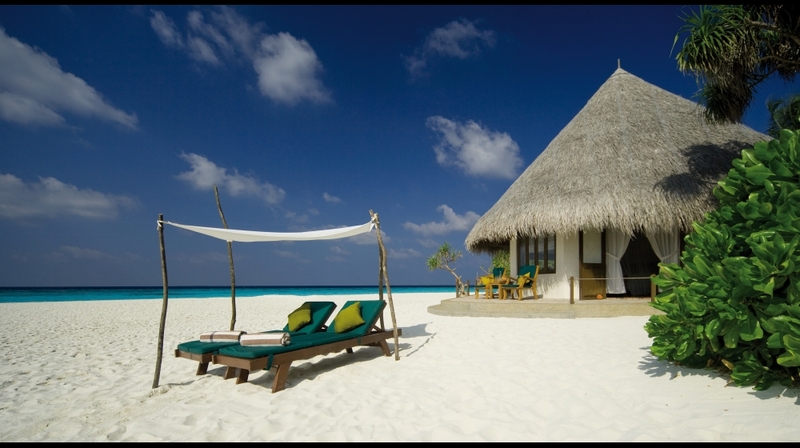 Under a Maldivian native-style pavilion, feel the sand on your feet, relax and enjoy snacks and drinks. Built on stilts over the lagoon with a wet area for swimmers and a dry area for a limited selection of drinks. Includes a wading area for romantic fun and togetherness at sunset. Diving: Novice or passionate, the underwater world is only a footstep away. Unique species, mesmerizing colours and absolute silence are the fascinating features of the Maldivian dive sites. Discover the Baa Atoll with our PADI certified dive school. 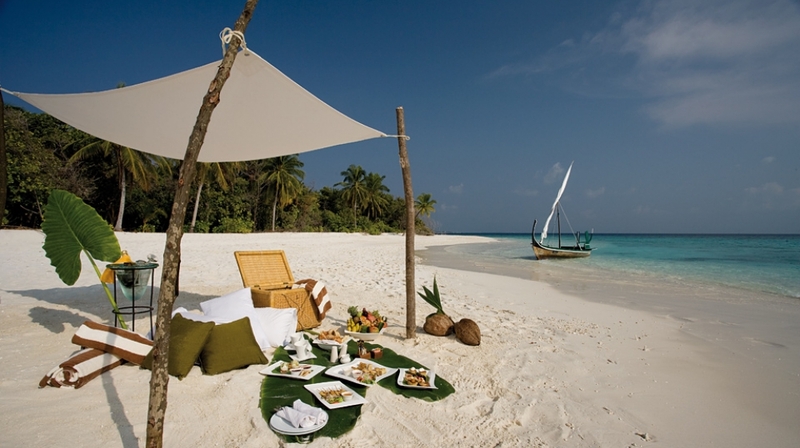 Choose from three delicious picnic hampers as the two of you escape for a fullday trip to a desert island. By Plane: The nearest airport is Male: 125km from the island. You can reach the Island by speed boat or small sea plane.